Please Note: the format of this review is different compared with others found in this archive, since it conforms to the style of GameTyrant’s “Games to Get” series. If you count yourself as someone who used to enjoy the athletic showmanship of the squared circle, particularly if you may not be a regularly sustained fan of the WWE’s brand of professional wrestling (*AHEM* sorry – “sports entertainment”), you likely haven’t missed the fact that the latest chapter in 2K Sports’ annual WWE video game series is back on store shelves and in digital download queues. Over the past several years, 2K and the WWE have made an effort to appeal to both current and lapsed fans of their product, giving fans unique opportunities to create “dream matches” of their favorite eras that would never be possible in a modern WWE ring. To a point, that strategy continues with WWE 2K17. With an extremely expansive roster that covers big and small names from a sizable portion of WWE and WCW history, along with the most detailed and comprehensive creative suite in the series allowing you to tailor even the smallest details of your experience, the game is very much designed to appeal to a wide spectrum of wrestling fans, giving you the spot of the WWE’s general manager position and emphasizing that you can make anything in your “WWE Universe” happen. This year’s pre-order star is none other than the biggest star WCW ever originally produced during its lucrative run in the “Monday Night War:” the man who went 173-0 and dominated the whole roster in spite of nWo dominance, Goldberg. Two years ago, 2K’s WWE series did not have an auspicious beginning on the current generation of consoles. While the visual look of everything in WWE 2K15 was overhauled brilliantly, the mechanics, modes, and options offered were all severely limited when compared with the prior year’s game on Xbox 360 and PS3. Last year, though, developers Yuke’s and Visual Concepts brought their A-game to WWE 2K16, opening up the gameplay possibilities with a wonderfully reverent single player mode, an expansive creative suite, and some slick, tight refinements to the controls. While on its face WWE 2K17 plays virtually identically to its direct predecessor, it’s the stuff that’s under the proverbial hood that tells the true story of what this game brings to the table, and what the others don’t (and vice versa). The most obvious advantage this year’s game has on previous ones is the creative suite, which grants a much deeper ability to create and edit your own wrestler and existing wrestlers’ attires and entrances, the most robust “create an arena” mode in the history of the franchise, and more inherent control in both those offerings in even the smallest components. While the developers haven’t quite mastered the ability for a player to import their own likenesses onto their created superstar, this year’s create modes should prove immensely satisfying to longtime players of the series, and should impress the hell out of any newbies that may join the fray here for the first time. The creative suite in 2K17 brings back many of its more robust features from prior games, making it just enough for robust than the prior year’s game. One omission that feels a little strange, though, is the lack of a single player “2K Showcase” story mode at launch. While we’ll be getting a few famous rivalries in this mode in the future as downloadable content, the mode is stuck behind a pay-wall by either shelling out for the game’s $30 season pass, or buying the packs individually as they come out. This is definitely a disappointment, since 2K Showcase’s somewhat stilted beginning in WWE 2K15 was tweaked brilliantly for last year’s offering. It’s a shame we have to wait to see the mode and what it brings to the table this year only after waiting weeks after the initial launch. Two modes that do make returns, though, are “WWE Universe” mode and “MyCareer.” Universe mode allows you to act as general manager of the WWE, booking matches, orchestrating title defenses, encouraging rivalries, and watching all of the drama play out in the form of playable matches throughout a calendar year’s worth of live events, TV shows, and pay-per-view events. MyCareer mode’s return likely adds the most substantive amount of content when compared with years past, allowing you to build up your place in the WWE from being an NXT rookie all the way up to a WrestleMania main event. Although missing a “proper” single player mode, the returning “WWE Universe” mode allows you to align yourself with the most infamous modern manager in the WWE: Paul Heyman. 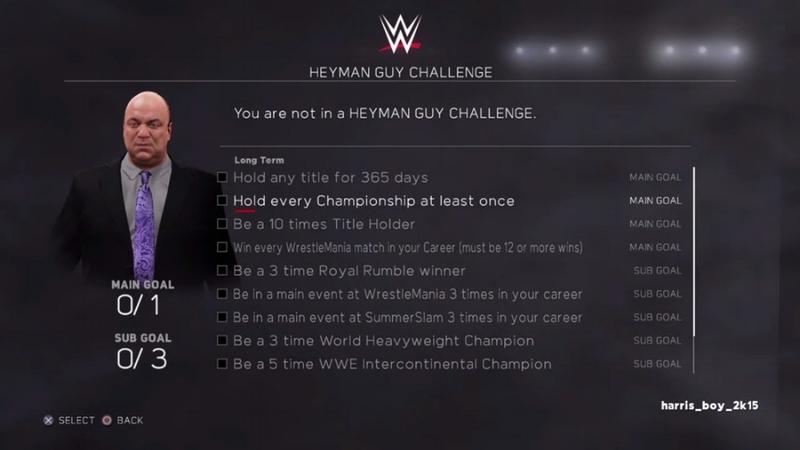 Beginning this year in MyCareer, you can align yourself with infamous WWE manager and former ECW mastermind Paul Heyman, while the mode also gives you unprecedented control over everything from shaping how your character delivers speeches on the microphone, to tinkering with your merchandise sales, as well as challenges to ingratiate yourself to the company’s corporate overlords, Triple H and Stephanie McMahon (aka “The Authority”). While WWE 2K17 isn’t the most revolutionary game in the series and includes some questionable omissions, it does represent a positive (if incremental) step forward for the series as a whole, and makes enough tweaks to the overall experience that it’ll keep series fans interested for a while to come. While we still have yet to get an entirely overhauled and polished experience, WWE 2K17’s technical fundamentals and customizability options easily make it the best pro wrestling simulator on consoles today. This review originally appeared on GameTyrant.com. A copy of this game was provided for reviewing purposes by representatives of Take-Two Interactive.